– First, know that the latest outbreak is not new, although the nipah virus is relatively unknown and has killed virtually all of its victims in India. 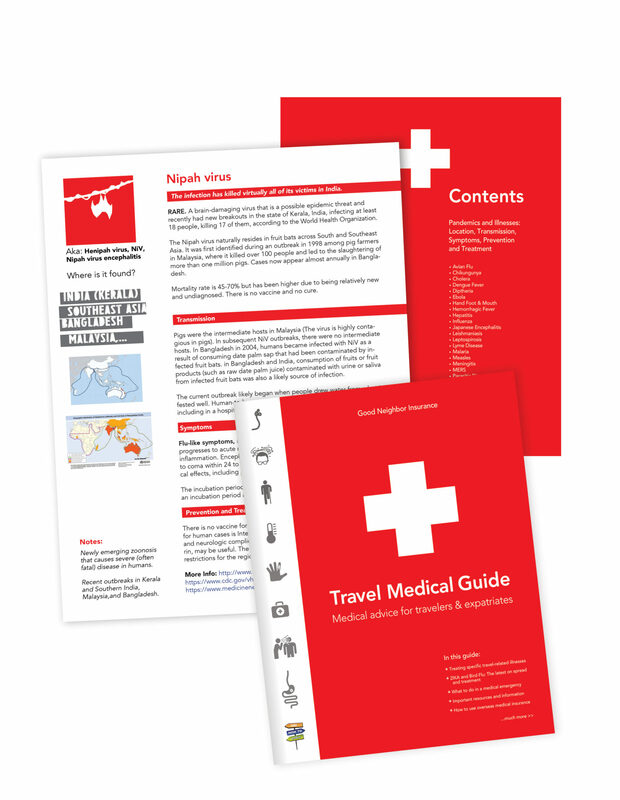 Second, know that preventing nipah is possible because the virus is very rare in terms of health risk – if you know the following information and practice safe travel/eating habits. 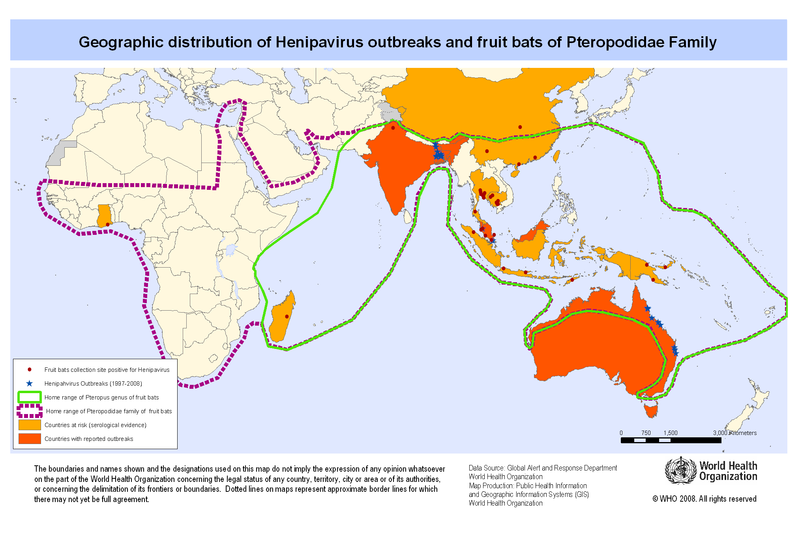 The Nipah virus (aka Henipah virus or NiV) has not been around for very long. It first gained worldwide attention in 1998 when an outbreak in Malaysia killed over 100 people. In that instance, transmission came through infected pigs but the suspected carrier worldwide are fruit bats. (Pigs just happen to be at risk of infection). In 2004, the Nipah virus again broke out. This time in Bangladesh as humans became infected through date palm sap that had been contaminated by fruit bats. Due to its similarity to a number of other flus and viruses, preventing nipah is hard since it is hard to diagnose. While the incubation period is 4-14 days, once someone starts exhibiting symptoms, it can result in coma or seizures or swelling of the brain in 24-48 hours, giving doctors little time to diagnose or respond to individuals patients especially at the beginning of an outbreak. There is no vaccine or cure of Nipah besides quarantine and intensive treatment of the symptoms. So far, the mortality rate is reported between 45-70% but is considered much higher outside of established outbreak areas, due to the difficulty to diagnose. Outbreaks have also been reported in Africa. Due to transmission via fruit, farmers and sellers of fruit in markets have suffered lost sales due to fear of contagion via saliva or urine of bats. 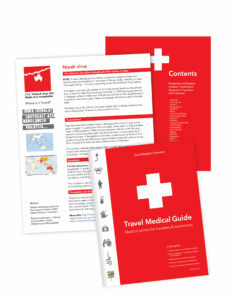 The World Health Organization has not issued any travel restrictions or warnings to travelers. Do not care for patients/the sick, unless you are a trained professional following safe medical standards and procedures to prevent known infectious diseases, especially in rural areas. Human-to-human transmission of the Nipah virus has occurred in a hospital setting. Be careful to only eat fruit you can inspect and properly sterilize beforehand. Avoid most pulpy/fleshy fruit (This is common sense for dealing with diarrhea which is a much higher risk for travelers affecting 40-70% depending on destination). Pork makes up about 38 percent of meat production worldwide. Eating pork that is properly prepared and cooked should be Nipah-free. However, avoid exposure to pig farms and handling raw pork. Always err on the side of caution when getting sick overseas. Having good international medical insurance is a must and most policies offered by GOOD NEIGHBOR INSURANCE have a toll-free number where someone 24/7 can direct you to the best local care clinic or hospital that follow “Western/European-quality standards” and have western trained doctors. Take care in areas known for bats, fruit bats, when spelunking, cave exploring, etc. as bats are known for newly emerging zoonoses (infectious diseases that can be transmitted between animals and humans). Especially as humans penetrate into areas that were previously undisturbed, for adventure sports, exploration, spread of urban areas, spread of slums, and deforestation. Bats harbor more viruses than rodents and are capable of spreading disease over a wider geographic area due to their ability to fly as well as migration and roosting patterns. In addition, bats (like rats) live and breed in, and nearby, human structures/urban areas undisturbed.